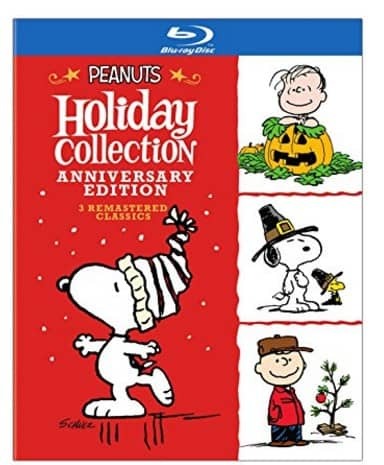 The Peanuts Holiday Anniversary Collection (BD) [Blu-ray] is on sale right now for $1996 at Amazon. That's 50% off the list price of $39.99! CELEBRATE THE HOLIDAYS WITH THESE TIMELESS PEANUTS CLASSICS! It's the Great Pumpkin, Charlie Brown: Will this Halloween be the one when the Great Pumpkin comes? Longtime believer Linus thinks so, and keeps watch all night in the pumpkin patch to welcome him. Charlie Brown gets into the spooky spirit too, dressing up as a ghost with more eyeholes than needed, but not scaring up the usual kinds of Halloween loot when trick-or-treating. Never fear, World War I fighting ace Snoopy is here to battle the Red Baron, and in doing so, crash Violet's Halloween party and Linus' vigil as well. Your whole family will be glad it crashed this party. Good grief, you can't help but have a happy Halloween! A Charlie Brown Thanksgiving: Two slices of toast, a handful of jellybeans, some pretzels … not quite what comes to mind when you think of Thanksgiving dinner? It's not what Peppermint Patty imagines either, but that's what she gets when she invites herself over to Charlie Brown's house for a turkey-day feast. After chastising “Chuck” for providing such a meager meal, she ends up eating more than her words and gains a few pounds of emotional sustenance. She also learns a little bit about the true meaning of the holiday. And you will too. Invite yourself to Charlie Brown's for dinner this Thanksgiving with A Charlie Brown Thanksgiving. Featuring two bonus episodes- The Mayflower Voyagers and Play It Again, Charlie Brown- and the chance to see Charlie Brown attempt to kick that football, you won't want to miss this classic. So take a pilgrimage to your living room and join Snoopy, Woodstock, Linus, Sally and the rest of the gang, right here! A Charlie Brown Christmas: Christmastime is here. Happiness and cheer. And for Peanuts fans everywhere, it just wouldn’t be Christmas without this classic holiday delight. Christmas lights may be twinkling red and green, but Charlie Brown has the Yuletide blues. To get in the holiday spirit, he takes Lucy’s advice and directs the Christmas play. And what’s a Christmas play without a Christmas tree? But everyone makes fun of the short, spindly nevergreen Charlie Brown brings back – until the real meaning of Christmas works its magic once again.